The Night Parade of One Hundred Demons: A Field Guide to Japanese Yokai written and illustrated by Matthew Meyer was able to be published in 2012 thanks to a Kickstarter project. The book grew out of Meyer’s “A-Yokai-a-Day” series of illustrations and posts on his website, which is how I first came across his work. Originally from near Philadelphia, Meyer has been living in rural Japan since 2007, where he draws inspiration for his art. When Meyer launched the Kickstarter project for The Night Parade of One Hundred Demons I immediately supported it. Over the last few years I have become increasingly interested in yokai—a general term used for a wide variety of Japanese spirits, supernatural creatures, and urban legends. There are actually very few books available in English that are devoted to the subject which is one of the reasons why I was so incredibly excited that The Night Parade of One Hundred Demons was able to make it into print. 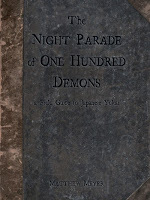 Meyer collects information on one hundred eight different yokai and yokai phenomena; the guide easily lives up to its name of The Night Parade of One Hundred Demons. Each entry in the book is accompanied by a full page, full color illustration which includes the yokai being discussed. The yokai in The Night Parade of One Hundred Demons are loosely divided into five sections based on where they are likely to be found: “In the Wild,” “Out at Sea,” “Out on the Town,” “At a Festival,” and “In the House.” Within these categories the yokai don’t seem to be organized in any particular way that I noticed, although Meyer does try to keep similar and related yokai close together. The Night Parade of One Hundred Demons provides basic information about yokai: names, habitats, diet, appearance, behavior, interactions with humans, origins, and legends. A list of references, bibliography, and a helpful index are also included in the book. Meyer’s artwork in The Night Parade of One Hundred Demons is marvelous. The illustrations take direct inspiration from traditional Japanese ink paintings and woodblock prints. They are very colorful, but instead of being garish Meyer has selected a more natural, subdued palette. Many yokai have close ties with nature and so I was pleased to see this reflected in Meyer’s artwork. He pays as much attention to the details of the yokai’s environment as he does to the yokai themselves. Occasionally Meyer takes a bit of artistic license, his yokai don’t always match up exactly with their accompanying text, but I really enjoy his interpretations. The artwork in The Night Parade of One Hundred Demons is one of the things that makes the volume so fantastic. I was just as happy flipping through the book enjoying Meyer’s illustrations as I was reading it. The Night Parade of One Hundred Demons is a very approachable volume. Meyer’s writing style has an almost conversational feel with just a touch of humor to it. A few minor typos managed to slip through the editing process, but otherwise The Night Parade of One Hundred Demons is a delightfully enjoyable and informative read. The sheer number of yokai covered in the book is wonderful. I was already familiar with quite a few of them but there were plenty that were new to me, too. I like that Meyer makes a point to note the significant regional differences of the various yokai included in his field guide. He also addresses the similarities and relationships that exist between different yokai. I absolutely loved The Night Parade of One Hundred Demons. If you are a fan of yokai, or even just a fan of excellent Japanese-influenced art, the volume is well worth looking into. I haven’t been this excited about a book for a very long time. Need… more… money… This book looks amazing. Added to my wish list! It really is! The cover doesn’t do the interior art any justice. I hope you get the chance to check it out.